Are Black Women Too Independent, Angry to Have a Man? Let’s Talk About It. Meme shared on Facebook that inspired Aleidra to write this piece. This meme (left) really bothers me. It bothers me because it perpetuates the stereotypes of black women being too independent, angry, having a bad attitude, undesirable, less than, etc. These stereotypes continue to be perpetuated by white and black people (the meme was brought to my attention from being shared by black men), and I am frustrated to specifically see black men degrade black women in this way. It frustrates me because people who perpetuate these stereotypes give little consideration to what could make black women be perceived as “angry,” or lead them to take on this “strong and independent” mentality. They do not consider how black female slaves often had their husbands and children torn from them (sometimes an enslaved man or woman pleaded with an owner to purchase his or her spouse to avoid separation), forcing a level of independence and emotional impact. They do not consider how to this day, black men are incarcerated at 6 times the rate of white men and serve exponentially longer sentences, again forcing a level of independence and emotional impact. They do not consider how in America, black women have a net worth of $100, having an unemployment rate that unlike most other demographic groups, continues to rise, and a wage gap that even a college education cannot bridge. They do not consider how society continues to remind people that black women are not beautiful, setting beauty standards and norms that are the exact opposite of black women’s natural being (light skin better than dark, straight hair better than curly, thin body better than curves…and when curves are accepted, they are sexualized as if that is all a curvaceous woman is good for). They do not consider how common attributes of black women’s personalities and culture are often deemed as “unladylike” and wrong (expressing your opinion, being “loud”), leading some men to actually believe that black women are indeed undesirable. Hopefully you can see that many aspects of our society have contributed to this perception of black women as angry, too independent, and too opinionated. Comment left on Facebook post of meme. it’s counterproductive because all it does is make black women actually angry, and rightfully so. If black women see black men share this meme openly, all it does is make black women defensive, and possibly feel the need to be more independent, because we are being generalized, our character is being attacked, and we are being portrayed as less than women of other races. How are we as black women supposed to take this? This meme lets us know that we can add (some) black men to our list of obstacles because instead of advocating for us against these stereotypes and ideas of black women, instead of fighting against the systems and oppression that contribute to these stereotypes and ideas of black women, instead of loving us through any emotional or mental impacts and insecurities that we have because of these stereotypes and ideas of black women, black men will now join in on keeping us down. We are in a movement for black lives right now. We’re trying to make the world believe that black lives really do matter– and not only in regard to police brutality. The movement is about gaining freedom and equality from ALL systems and beliefs that disadvantage, target, omit, and oppress black people, and this is one of them. Even in this movement, we see black women being disadvantaged and left out. That’s why some have taken additional steps past “black lives matter” to say black WOMEN’S lives matter, and use hashtags like #SayHerName. It’s so unfortunate to see this omission because many black women are on the front line advocating and fighting for black men against police brutality. It is so sad that black women can’t get that same support from black men, even with something as simple as not spreading social media memes that degrade us. Another factor of this meme could be society’s definition of masculinity and “being a man.” Our society teaches men, in general, to be tough, stoic, acquisitive, and self-reliant. Psychologists have stated how this can lead to, “aggressive, emotionally stunted males who harm not just themselves but their children, partners and entire communities.” So what we see happening is (black) men trying to live up to this social construct of masculinity. But, in order to reach it, men are (maybe unintentionally) chastising (black) women for being too strong and acquiring their own things, not because it is wrong for (black) women to do, but because it takes away from men’s concept and fulfillment of masculinity. This shows a need to redefine masculinity (with a new definition that includes a range of human emotion, is more flexible than dichotomous) because men’s quest to fulfill this societal norm is hindering (black) women. 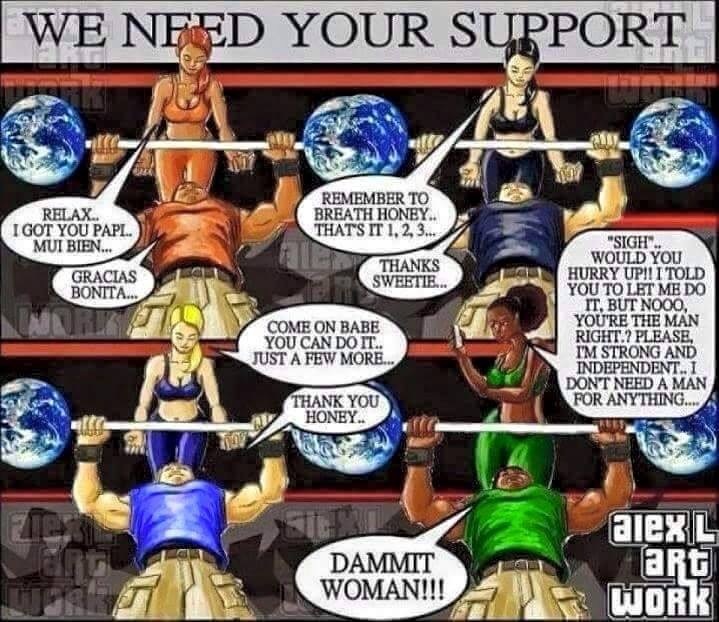 So, while I do not agree with the perception of black women that this meme portrays, I am acknowledging the potential roots of the perception, with the hope that if we are aware of these social constructs, we can learn to love each other through them, instead of using them to put each other down. No doubt, there are probably black women that display some of these stereotypical characteristics, just like there are women of any other race that probably show these traits. But maybe she is showing them for a reason. It’s problematic that some black men are choosing to stereotype black women and write them off as undesirable partners instead of considering why she may act this way, or more importantly, their possible role in why she is acting that way (specifically on a one-on-one basis, in a romantic relationship). I guess it’s a lot easier to criticize the black woman based on the negative perception she’s been given by society than to look at yourself and ask what you may be doing to yield that type of response from her. There is a thin line between a black women not putting up with a man’s crap and being angry, (too) strong, and (too) independent. Just because a black woman does not say “yes” to everything you want or doing everything your way does not make her “angry.” It just means she expects (and will not settle) to be treated as the queen she is.